Amos L. Beiler, a Mennonite folk artist of Narvon, Lancaster County, Pennsylvania, was born in 1888 and died in 1984. He crafted scenes on plaques and as whimsies in bottles. He had a very distinctive style that makes his work readily recognizable. His scenes were made up from many small pieces of thin wood cut with a jigsaw or carved for the shapes he needed. 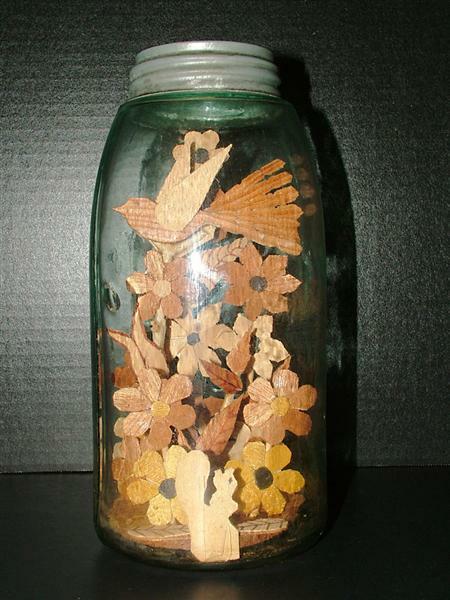 His flowers, for example, were made from thin circles of wood glued together to form the flower petals. Behind the petals were thin caved wooden leaves. Birds could always be found in his bottles. His bottles were fancifully filled with delightful scenes, usually, farms and landscapes that filled the bottle up through the neck opening, but often were a historical record of births and deaths. The finished wood he put in the bottle was a combination of its natural color to some being painted in reds, yellows, greens and blues of Pennsylvania Dutch style. In addition to his bottles, Amos Beiler also made plaques of the same style as his bottles. 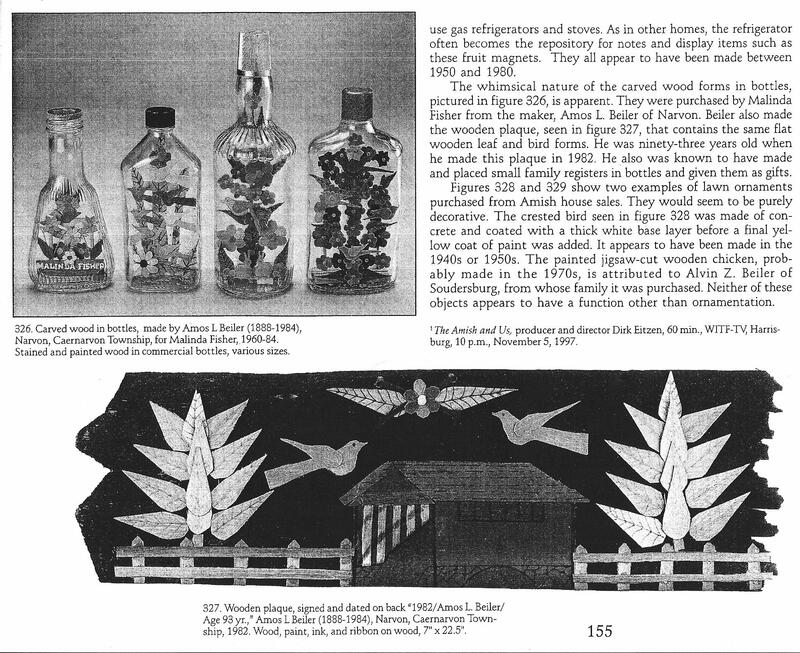 He often gave these bottles and plaques to family members while others were sold to the public. Type: English : *Book Publisher: Atglen, PA : Schiffer, ©1998. 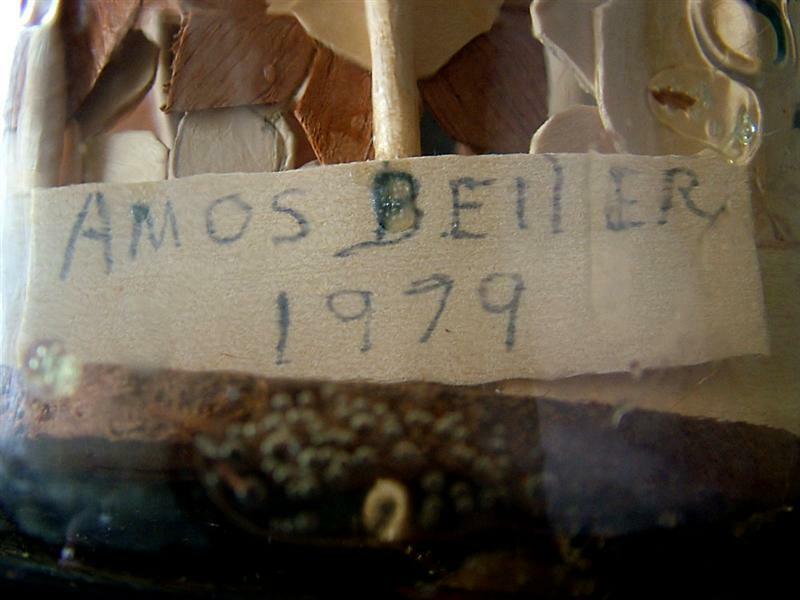 The following bottle is an interesting and rare Amos Beiler whimsy in a bottle. Not only is it in a Mason jar, it is also signed and dated 1979 by the artist. Other than the plaque shown above, this is the only other craft by Amos Beiler that I have seen signed and the only one in a bottle. The whimsy was constructed in an old 9" tall by 4 1/2" diameter Mason jar showing the 1858 patent. It is in excellent condition and was acquired from an estate sale.